The "House of Light" is located between Hod and Yesod. 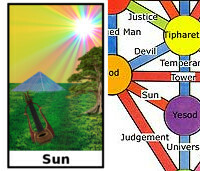 It is associated with the tarot card the Sun. One of the most joyful places that you can ever be in is when some cherished and desired reality creation manifests. You are centered in a state of joy, you are immersed in the moment, your emotions are flowing through you like a river and collecting in a pool around you. This is probably the highest state of being that is obtainable while physically focused. It is this state of being that is the most sought after in physical experiences, and yet it is often the most fleeting. This pinnacle point of existence is usually short lived, and it often makes you wonder how something so good can fall away from you so fast. This moment of clarity, joy, and peace, is the Sun energy. The Sun’s energy is solar in nature. It is bright and illuminating. It gives hope and exposes the darkness that is around you. 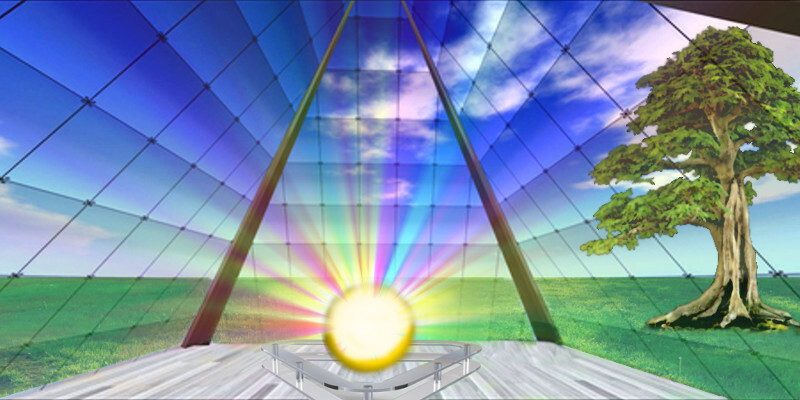 The “House of Light” is a place where this energy is collected and stored. Inside the “House of Light” you may find mirrors. They amplify and reflect the Sun’s light. The house contains it. This light must be contained while you are a physical creature because this energy can fall away from you like sand does when you try to hold it. Physical experience is made up of many states of being. These states of being all compete for your attention. It is a daunting nature to hold any one of them for any length of time. Yet the one that is probably the most worthy of holding on to is the Sun energy. For this reason this special place exists within you that can hold this energy and release it into your reality when the time is right. The goal from the House of Light is to experience pure joy and illumination in your life, to allow goodness and fortune to smile upon you because you are worthy. You carry the spiritual spark with you and that means the universe loves and nurtures you. Many times we experience so much hurt in our lives we forget what it is like to feel any different. Here, in this place, you can re-experience joy and hopefully over time, make it a repeat showing in your life. The main spirit guides at the “House of Light” are the Greek god Apollo or the Egyptian god Ra. These are the traditional Sun gods. They embody the best and highest state of being that is physically obtainable. You will probably meet them, or someone similar, and they will send you on a quest. This quest will explore your solar energy and what you are capable of achieving and what brings you the most joy in your life at this time. These quests are often fun but also can be important and vital to your progress forward as a spiritual being. You may hear your favorite music playing while here and get to experience that transcended feeling when you are listening to music you really like. The primary one time gift here is the energy of spiritual joy. Spiritual joy is not like physical joy. It goes way beyond that. It is a joy that sings from the depths of your being, like a favorite melody or song does when you listen to it. This spiritual-joy is what makes a “master” charismatic and draws others to him or her. It creates an energy around you that seems to make anything possible. You become a Sun in your own reality, casting light and love wherever you go. Secondary gifts here vary. You may get the “mirror,” which can be used to see into your inner light to review its condition, or be pointed at others to help them see their own inner light. 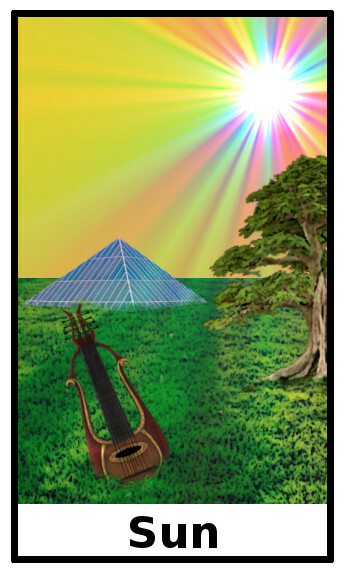 If you get the “lute” (or in today’s speak the “boom box”), it can soothe even the most hostile of people with its calming inner music. The gift of “sunglasses,” can be used to protect yourself from harmful energy. One of the higher level gifts that you can get is the “Golden Tree.” This high level gift shows that you have reached an advanced state of being, able to turn your acquired knowledge into wisdom. You bear fruit and those that eat that fruit will learn and grow as well. Many people who are of the teacher blueprint will get this gift. Mirror: see your inner light and its condition or point at others to help them see their inner light. Lute (or boombox): can sooth even the most hostile people. Useful when confronted with many angry people. Sunglasses: Protects you from harmful energy. Demon busters like to put these on before going into battle. Golden Tree: You are able to turn acquired knowledge into wisdom quickly.